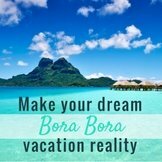 Taking a Bora Bora Cruise? 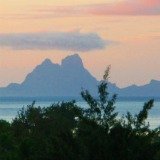 Taking a Tahiti Cruise to Bora Bora? 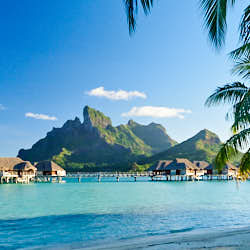 A Bora Bora cruise is a fun and practical way to visit this island paradise. 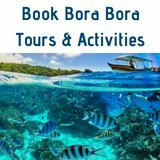 Many people ask us what the main attractions around Bora Bora are and how to get from the cruise ship to these attractions. 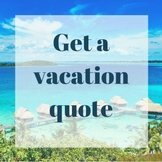 If you like being independent and doing things on your own, here is what you need to know to plan your excursions in Bora Bora. Bora Bora Cruise ships have only one narrow pass through the reef which surrounds (and creates) the magical lagoon. They sail through a narrow channel and anchor in deep water, near Vaitape. 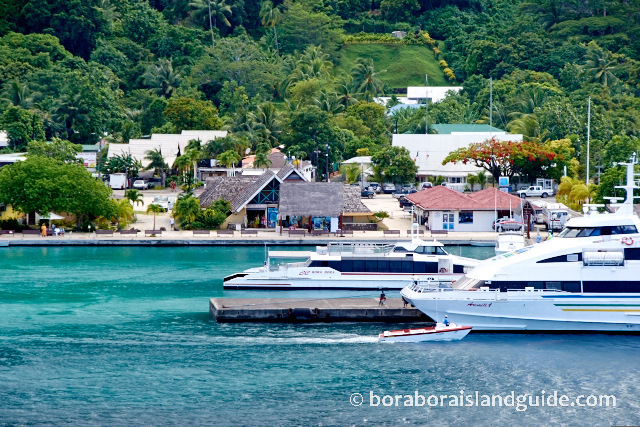 Your Bora Bora cruise ship tender will drop you off at the main pier in Vaitape. 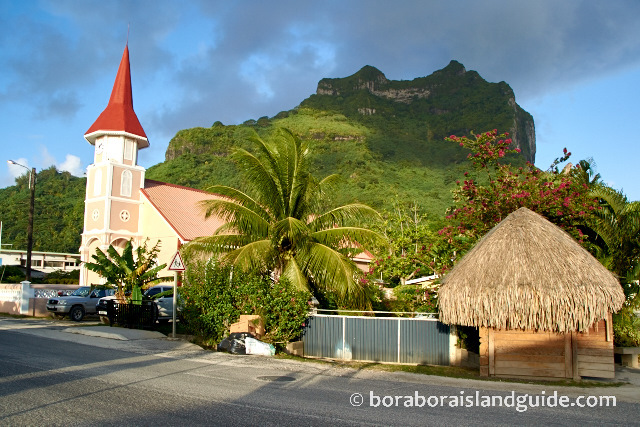 The sleepy town is vibrant on the days that Tahiti cruises come to Bora Bora. (Unless it's Christmas day!) 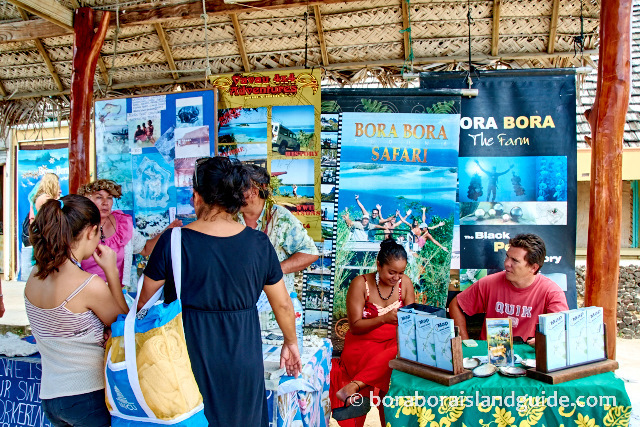 There will be a local Bora Bora market set up there to welcome the Tahiti cruise ship. It's a special day for the islanders too, as only a few ships cruise through each year. This is a great place to buy souvenirs that are made with great pride by the locals. 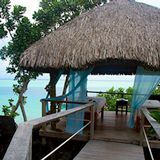 You can find traditional hand painted pareos, intricate shell jewelry, carved Tahitian sculptures and much more. 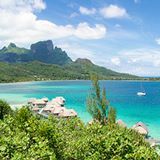 There are some great excursions offered on your Bora Bora cruise, but sometimes it's best to organize your own. A variety of the main tour providers will be set up by the dock with information on excursions. If you miss out on the ship's excursion of your choice, or would prefer to take excursions with smaller group sizes, you can opt for one of these. 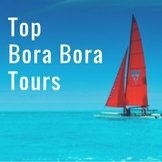 Buying Bora Bora excursions directly from the tour provider usually costs less. All the most popular excursions are on offer: Shark and Ray feeding, Snorkeling, Jet skiing, Submarine rides, 4X4 tours. 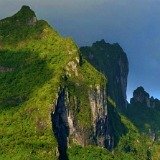 If you are keen to do a unique excursion, then you will need to organize this well before your Bora Bora cruise. For example, some of the best lagoon tours with the most popular guides only take a few people, so get booked out months in advance for busy times. 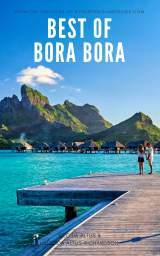 Here's a description of all the Bora Bora excursions you can choose from. The main town of Vaitape is on the Circle Island Road. This road goes around the perimeter of the island. It's a small town so you can walk from one end to the other end in a few minutes. 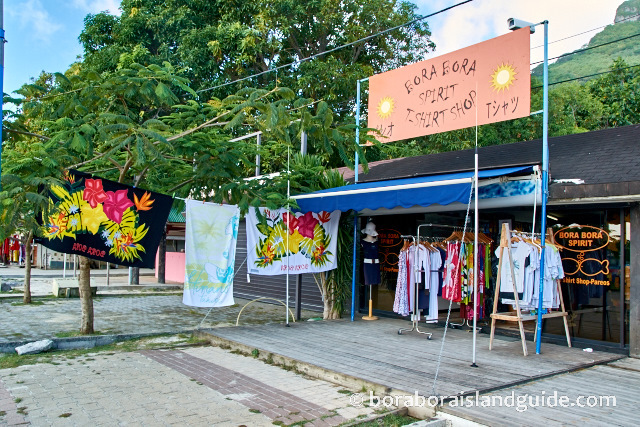 There are quaint Bora Bora shops along the road selling all kinds of Tahitian souvenirs, including home wares, books and hand-printed T-shirts. You'll also see some cafes and supermarkets. Chin Lee's supermarket is the closest to town and is worth a look. 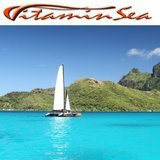 The most beautiful places in Bora Bora are outside of the main town, so do take an excursion or make your own way to Bora Bora activities. The Circle Island Road winds for 32 kilometres (20 miles) around Bora Bora. You can take a Circle Island Tour, or hire a bicycle or car to get around and visit the sights yourself. 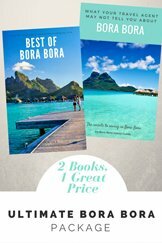 Have a look at the Bora Bora attractions you will want to look out for on your way. A 4X4 tour is the only way to get up into the rugged inner island and see the beautiful Bora Bora lagoon colors from above. To lie your towel on a beach crowned “Best Beach in the World”, you can take a 10 minute taxi ride. This will cost about $5 per person. In fact the best attractions on the main island are within a few minutes by taxi. 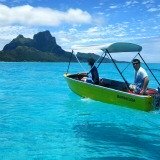 One of the major ways to get around Bora Bora is by shuttle boat! The most exclusive resorts are out on motus in the lagoon. 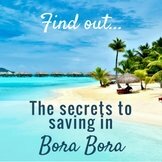 So don't think you are going to drive by and see all the beautiful Bora Bora resorts. Actually, the most you will see of them is on a lagoon tour, when you will boat past their stunning over water bungalows. There are a few resorts which allow guests to visit. 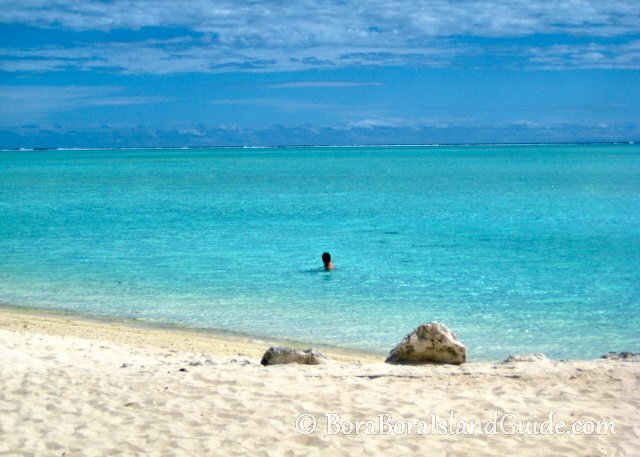 To see the picture postcard side of Bora Bora you will need to get out onto the lagoon and the motus (sandy islets). Taking a Circle Island Tour on the lagoon will allow you to truly appreciate the beauty of this island. 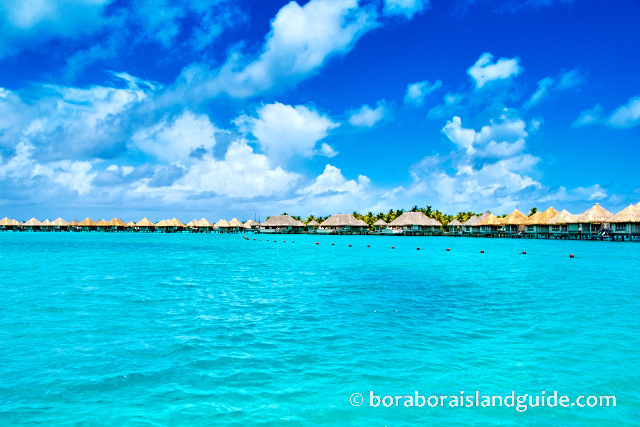 What you see as your Bora Bora cruise ship sails into the magnificent lagoon is only a preview! 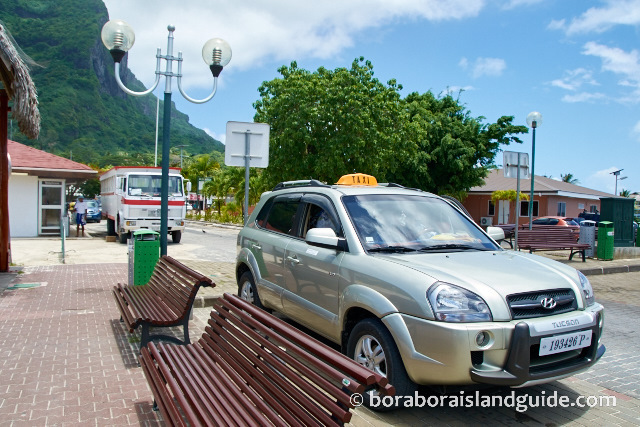 All the best Bora Bora restaurants provide a complimentary pick up, and drop off, shuttle service so if there's one you would like to try out you can make a booking and organize to be picked up from Vaitape pier. There's a phone booth nearby if you need to make contact. 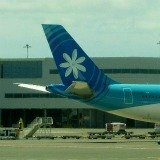 We have been to Bora Bora on Tahiti cruises five times. 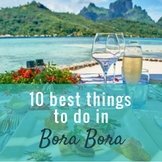 Here's a list of our suggestions for favorite Bora Bora activities and attractions that you can visit independently from a cruise ship. When planning activities, remember that you must be back at the Vaitape wharf in time to catch the last tender back to your Bora Bora Cruise ship. 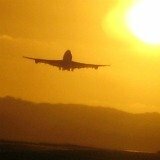 An earlier time is set on departure day.